Addressing the complex needs of children, families and communities requires effective working partnerships across sectors, systems, and programs. Chapin Hall actively partners with policymakers, frontline workers, other research and policy centers, and philanthropists to build evidence-based solutions that work in context. By combining our perspective with that of our partners, we aim for positive change that leverages the strengths and resilience of children, families, and communities. 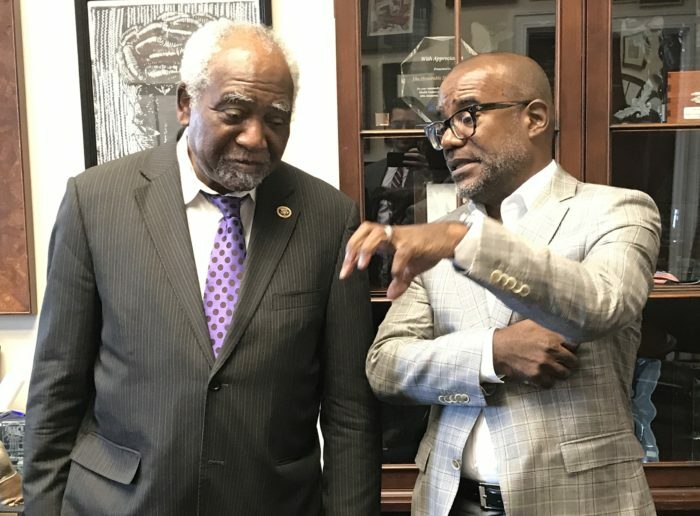 Chapin Hall Executive Director Bryan Samuels (right) talking with U.S. Representative Daniel Davis. Chapin Hall provides federal, state, and local decision makers with rigorous data analysis and achievable solutions to support them in improving the lives of children, youth, and families. Our unique blend of research, practice, and policy expertise is focused on impact. Chapin Hall works with those responsible for delivering evidence-based interventions, improving outcomes, and using data. We understand the demands of public and private agency service, and provide practical tools and tailored solutions to strengthen capacity and meet goals. Read about our partnerships in Illinois, Los Angeles, and New York State. Chapin Hall is dedicated to creating and using knowledge to accelerate and sustain change. Chapin Hall is an independent organization affiliated with and located on the campus of the University of Chicago. With the University of Chicago, other institutions of higher education, and research and policy centers across the country, we are using science to shape policy, programs, and practice. Read about our partnerships with the Chadwick Center, and the University of Chicago. Chapin Hall innovates with philanthropy to improve outcomes for children and families. Together we seed change by designing and testing new ways to work in and community-based services. Read about our partnerships with Casey Family Programs and our donor-advised work in youth homelessness. All of these partnerships promote the use of evidence and data in decision making to accelerate positive change for children and families.